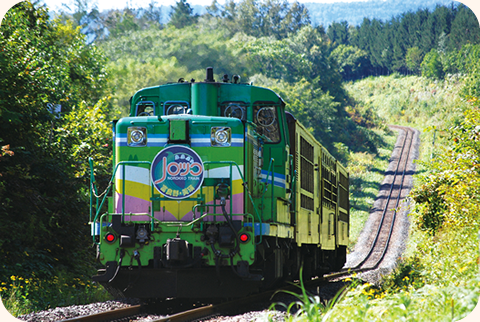 The special Furano-Biei Norokko-go train on the JR Furano Line stops at this station only in summer. If you plan to come to Farm Tomita by public transport, we recommend that you take a train and get off at the station. Take a train from Furano Sta. on the JR Furano Line or from Asahikawa Sta. on the JR Hakodate Trunk Line to Lavender Farm Station. 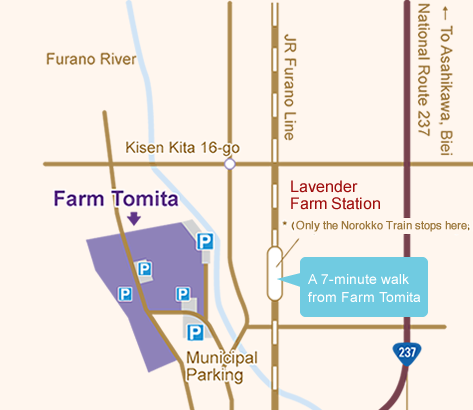 It's a 7- to 8-minute walk from the Lavender Farm Station to Farm Tomita. The special Furano-Biei train also stops at the Lavender Farm Staion in 2019. The Norokko-go operates during the following periods in 2019. Saturdays and Sundays between June 8 (Sat.) and June 16 (Sun.). Every day between June 22 (Sat.) and Aug. 18 (Sun.). Saturdays, Sundays and national holidays between Aug. 24 (Sat.) and Sep. 23 (Mon.). ※The Rapid train operates during everyday between July 6 (Sat.) and Aug. 12 (Mon.). Lavender Farm Sta.⇔ Furano Sta. Lavender Farm Sta.⇔ Biei Sta. Lavender Farm Sta.⇔ Asahikawa Sta.